The Staff Selection Commission is conducting Combined Graduate Level Examination (Tier-II), 2017 with effect from 17.2.2018 to 22.2.2018 across the country. The last date of the examination is 22.2.2018. It may be relevant to mention that today i.e. 21.2.2018 in the morning at about 8.45 AM before the start of the Paper-I Examination (Quantitative Aptitude), the Service Provider informed the Commission that due to a technical problem, downloading of data could not be completed at some venues. Accordingly, the entire process of downloading of data had to be done afresh resulting in some delay in the start of the examination at all venues across the country. The examination started at all venues across the country at 12.10 PM and was successfully completed after providing the full time of 2 hours to the candidates at each of the venues. i.e. 2.10 PM (for VH candidates at 2.50 P.M.) As against 41,331 candidates who were scheduled to appear in the said paper, the attendance was 80 per cent. The examination was conducted successfully at 204 venues out of a total of 206 venues. 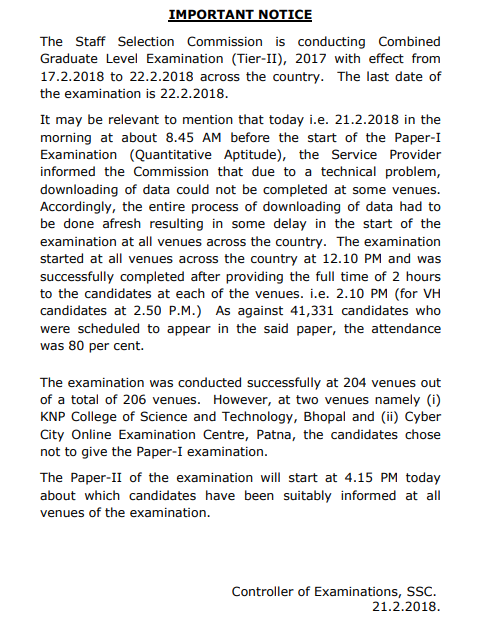 However, at two venues namely (i) KNP College of Science and Technology, Bhopal and (ii) Cyber City Online Examination Centre, Patna, the candidates chose not to give the Paper-I examination. The Paper-II of the examination will start at 4.15 PM today about which candidates have been suitably informed at all venues of the examination.